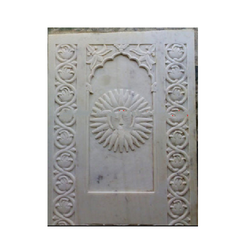 Marble Carved Panel manufactured by our artistic workers with 50 years experience in carving. Pride Stone Impex Stone Panal is a range of solid stone tiles designed to create stunning walls, inside or outside. All tiles in this series are made from individual pieces of stone that are precision-cut and fitted together to produce the most remarkable result. A precious piece of artistry, these marble wall panels are great to bring the beauty of nature on the wall of your room. Sleek yet durable, these designer wall panels entice the senses. We are well Known for its Marble Wall Panel work here in Jaipur & nation wide. With a team having specialization in different fields we have emerged as leaders in marble carving. This Marble wall panel is a perfect example of art bounded with luxory.We do only export. We are one of the leading manufacturers of Ceramic Wall Tiles with full HD digital printing technology. We offer different sizes and also different creative varieties in wall tiles as below. We are presenting our clients a captivating range of marble clocks that is artistically crafted by our skilled artisans. Widely used as a decorative item, our clients can avail these clocks at competitive prices.